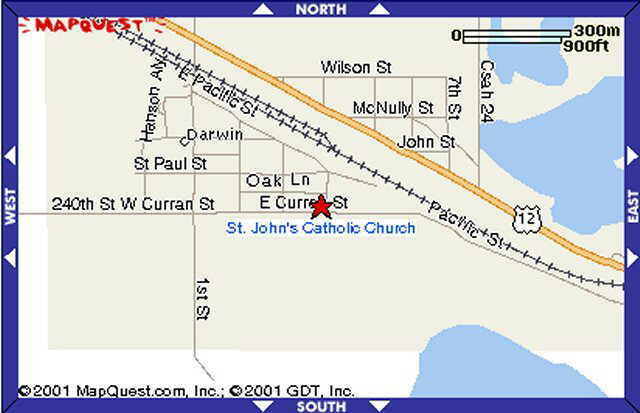 St. John’s parish had its beginning with the arrival of Catholic settlers in Meeker County in 1856. Sioux Indians fished and hunted undisturbed in the "Big Woods" of Minnesota, until 1856. Three white men paddled up the Crow River in the spring of '55, searching unsuccessfully far pine timber. John Huy later returned and with a companion wintered in the Harvey Township area. In the spring of 1856 they claimed the Forest City site on the Crow River. The Church does not grow in a vacuum. The seed of faith is sawn among men and in same fashion contacts and moulds the community in which it falls. The history of a parish records and describes this process. The history of any single parish must be traced, so that the movement of its growth can be accurately gauged. The wave of emigration then flawing from the eastern United States brought these settlers, and the Irish among them brought their Catholic faith to the new community. John Whalen and John Flynn arrived in the spring of 1856, almost drowning before they had staked their claims. Hunger and thieves dogged their return to St. Anthony and their families. But by October 22nd, 1856, they had returned to their claims and founded homes in the wilderness. Other Catholic families had arrived in the summer, among them the Thomas O'Doughertays with seven children and John O'Doughertay (a widower brother of Thomas) with six children. The two brothers had been barn in County Dunnegall, Ireland, and had arrived in the United States in 1840. In the spring of 1856, while living in Joliet, Illinois, they had heard of the opportunities in the Northwest, and they set .out to stake their claims. With oxen and horses, chickens and caws, in the caravan, their covered wagons arrived in Forest City on July 14, 1956. On the next morning Catherine O'Doughertay bare her husband, Thomas, a child, wham they named Sarah Jane. She was the first white child barn in Meeker County. These families farmed the first nucleolus of Catholicism in Meeker County. 1857 saw another wave of Irish families reach the county among them Patrick Finnegan, Andrew Sullivan, Bryan McNulty, Edward Campbell, John and Michael Murray, and Patrick Casey. A sizeable congregation was present, but where were they to find their clergy? Descendants of this family of Casey's still in our Darwin parish are: Edmund Casey, and Elizabeth Larch, and Mrs. Henry Quinn. The Diocese of St. Paul had been erected in 1850, but Joseph Cretin, the first bishop (who died in 1857), had established a priory at St. Cloud. The notice, "Forest City, Meeker Co., attended by the Benedictines", found in a Contemporary record, is the laconic title far a story of pioneer devotion and courage in the face of grueling hardship, a story that begins in 1857. In that year, it is almost certain; the Mass was first celebrated in Meeker County. Fr. Alexius Roetzer O.S.B. plodded the miles from St. Cloud to the plain lag cabin of John Flynn, and with the Catholic families of Meeker County gathered about him the Mass was offered, the Sacraments were administered, and all received instruction. A year had passed before Father Alexius ap­peared once more to the Flynn Cabin, for the young missionary had the settlers of four counties in his charge. So that the priest could came more often and conveniently young John Flynn rode to St. Cloud leading a second horse far the priest. Even so the frontier took strength from priests as well as its settlers and Father Alexius died in 1860 at age twenty-eight. Other missionaries from the St. Cloud Abbey, Father Witcomb and Father George Sherer attended the settlers. Father Meinulph Stukenkemper being in Meeker County at the time of the Indian Massacre in 1862 saw many settlers leave far a safer home. But by 1865 with the quelling of the Indians and the end of the Civil War, Meeker County began to grow to 1200 people. The idea of a church became a reality with Father Augustine Burns, OSB, celebrating the first Mass at St. Gertrude's on Christmas Day 1867. Being a man of vision and interested in founding a college, Father Burns persuaded railroad officials to give him property in Darwin overlooking Darwin Lake. November 12, 1867 the deed was recorded. Fr. Burns mission field included Stearns Monongalia, Kandiyohi, Pope and Douglas Counties. By 1869, 80 families were registered at St. Gertrude's. Occasionally he would stay a week in an area preparing the children far First Communion and saying daily mass. First Communion class number 25 with about to Sunday communions. In 1869 the rails were laid to Darwin and Litchfield was founded and named the county seat. Darwin village was laid .out and platted by John Curran and Martin McKinney of the St. Paul and Pacific Railroad. Covering parts of sections 23 and 30. Bishop Grace of St. Paul now had sufficient priests to minister in Meeker County so with the establishment of St. Columban’s at Greenleaf in 1870, a new era of diocesan priests came to Meeker County. The following list of pioneers in the Darwin area had to walk to St. Gertrude's for Sunday Mass: John Curran, Patrick Casey, Timothy Dunn, James Shelley, James Deary, Owen Printy, John Smith, Richard Fourre, John Quinlan, Richard Doyle, John McRaith, Jeremiah O'Brien, James Barrett, John Doyle, Michael Gallahue, Michael Roberts, John Hughes. The land intended for a college by Fr. Burns now became Darwin's St. Johns. Father Arthur Hurley, the diocesan priest of St. Gertrude's lived in Litchfield and had missions on the rail line to the west. Fr. Thomas Cahill came as pastor as rigors of the ministry proved too much for Fr. Hurley. In 1874, Father John McDermott brought a zeal for the temperance movement and his mission circuit was smaller than his predecessors. In addition to Forest City he had Greenleaf, Willmar, Waverly and Benson. In 1876 Father John Ireland was consecrated coadjutor to Bishop Grace. Father McDermott was given charge of the Catholic immigrants in the St. Paul Diocese. So although he no longer had Swift County, he added Kandiyohi and Fallon settlement. Under his direction the Church of Our Lady at Mannanah was begun in 1876. St. John's Church was begun under his direction in 1878 with first mass on Dec. 8, 1878. Cost of the structure was $3,000.00 with debt being paid the following year. John Curran donated land for cemetery across from church in 1880. Father McDermott continued his temperance work and the St. Mathews Temperance Society grew in numbers and in service to the communities of Meeker County. In summer of 1881 a Jubilee observance was held at St. John's and Fr. Damasus came from Delano to add a suitable variety to preaching and services. Fr. McDermott was transferred to Degraff in January 1882. For all his mission circuit he never failed to answer a sick call during the seven years he worked in Meeker County. New pastor Father Patrick Kenny incorporated the church on March 20, 1883 with Patrick Casey and Brian McNulty signing the Articles of Incorporation. A fall festival was held in 1884 to aid in furnishing the new church. A tower was added to the church and the bell donated by Mrs. Sarah McKinney was hung in memory of her brothers Thomas and James during the pastorate of Father Lee, May 15, 1892. The family of John McRaith presented the main altar; the Barrett family gave side altars. Edmund Casey donated the Stations of the Cross and Mrs. John Hughes the baptismal fount. In September 1883 Father McDermott had returned to be pastor of Forest City and again at Darwin. In June of 1885 he began a rectory building in Darwin with a cost of $965.00. Early in June 1887 Fr. McDermott was injured stepping from a moving eastbound train in Darwin. Thrown off balance he slipped between two cars and was saved by a nearby brakeman who held him until the train could stop. The severe shock hastened his death and Fr. McDermott died of paralysis on Nov. 9, 1887 and was buried at his Darwin cemetery. Father Joseph V. Tracy came to Darwin Nov. 21, 1887, formerly of Boston where he had been an in­structor at a boy's school. In addition to the mission at Forest City Father Tracy organized catechism classes in various school districts. Father went east in February 1889, returning July 1893. On March 29, 1891 Father Ambrose McNulty, a Darwin native born in 1868, celebrated his first mass at St. John's. He was appointed secretary for Archbishop Ireland and put in charge of the diocesan paper. In 1896 he was made pastor of St. Luke's serving there until his death in 1910. Father Edward Lee served Darwin from April 13, 1890 until February 8, 1893. Father McNulty and Father Boland of Litchfield were also present at the dedication of the church bell. Father Boland ministered to Darwin until Father Tracy returned before Father P.J. McCabe arrived in Darwin September 1, 1893. Father McCabe was interested in the temperance movement and he worked with the young people of the parish. He wrote and coached plays and played his violin at the various social gatherings. He was instrumental in the building of St. Charles Hall in 1894 then adjacent to the cemetery. On March 26, 1894 Darwin was host to the Sixth District of the Catholic Total Abstinence Union of the- Archdiocese of St. Paul. The 75 society members from Darwin met 200 people and 12 priests at the train. A flag waving procession was formed to the church accompanied by the Litchfield Coronet Band. Father Guillot of Waverly celebrated Solemn Mass and Father Ambrose McNulty preached. Father Boland also attended and stayed for the dinner following in St. Charles Hall. A play by Father McCabe was given in the evening. Father Dobbin, a very small man in stature but scrupulously faithful, came to our parish in the year 1902. It was under his guidance that the parochial residence was erected and the church repainted and re-decorated; also the new main altar, side altars, new Stations of the Cross were installed and a new baptismal fount provided. This, of course, raises a question of whether the parish is 100 years old, or 101 years old, but we will leave the resolution of that problem to some future historian. Missionaries provided service during Father Ryan's prolonged illness, and on October 8, 1936 Father Martin Donavon was appointed pastor. He remained during the World War II years, when Father Cam­pbell replaced him in 1945. The beautiful grotto in honor of Our Lady was built east of the church with all volunteer help, an expression of the deep devotion to Our Blessed Mother. In 1955 the 75th Anniversary of the parish was celebrated. It was a two-day celebration, presided over by Archbishop John G. Murray of St. Paul. A large number of priests gathered on Saturday to celebrate the event. They were served a sumptuous meal in the afternoon in old St. Charles Hall. The following Sunday there was mass for the people and dinner and activities followed. It may seem strange to some that there should be this division, but at that time in history there were no anticipated masses of obligation, or afternoon masses permitted. Priests were for the most part required at their own parish on Sundays. St. John's parish was motivated to begin to plan for the erection of a new church upon the receipt of a very substantial bequest received from the estate of Mabel O. Schultz. Under the direction of Father Fleming, architects were hired, contracts signed and construction was underway in 1958. The new church was dedicated on the Feast of the Assumption, August 15, 1959 by Bishop Alphonse J. Schladweiler. We would like to think the new church project would elicit a spirit of unity within the parish. However, the contrary was true, and there was bitter dissension. The question was not, to build or not to build, but where to build. Sides were chosen consisting of those who wanted the new church built on the site of the old church, where it now stands, and those who wanted to choose a new site adjacent to the cemetery. There was much debate; delegations went to the Chancery Office. In a moment of frustration, the pastor suggested the disagreement could best be settled by building the new church in Dassel. While the beautiful exterior of the church was completed in 1958, the interior is being finished little by little. Much of the old equipment was placed in the new church, and previously owned pews were purchased from Our Lady of Grace parish in Edina. The church hall was renovated during the sixties by Father Charles Stark and stained glass windows installed as a centennial project in 1978. The sacristy and kitchen still remains to be finished. It was only a few years later, when the advent of the Second Vatican Council necessitated changes in the location of the altar for mass facing the people. This was done under the direction of Father Donald Eichinger. The first English Mass replacing the traditional Latin Liturgy was celebrated in St. John's on December 1, 1964. The Centennial Stained Glass Windows were dedicated on September 10th, 1978 with Father Thomas Exley as celebrant. Following is a description of the stained glass windows: Click on any of the pictures for a larger view. 1-Creation: the hand of God reaching out from the sun symbolizes the beginning of the world. The display of light flowing down from heaven creating all things on earth and in the earth. The lower hand represents the creation of man. The birds, fish, water and tree with the rainbow represents all other things. 3-Covenant: This window illustrates the covenants of the Old Testament. The flaming sword is for the covenant established by God with man at the fall. Also shown is the rainbow, the covenant with Noah, the multitude of stars, the covenant with Abraham, the flaming bush the covenant with Moses, and the new nation of Israel 'd the Star of David, God's renewal of the covenant with the prophets. 4-The Prophets: The scroll and tongs with burning coal symbolizes the prophet Isaiah. The damaged well and flames symbolize the prophecy of evil and destruction Jeremiah 2:13-15. Ezekiel: The gate of heaven symbolizes his prophecies. Daniel: The goat with the four horns symbolizes Daniel's visions as in chapter eight. 5-Annunciation: The Archangel Gabriel is represented by the wing and hand. The lily represents Mary receiving the Annunciation that she was to become the Mother of the Son of God. 6-Nativity: The rays flowing upon the Chi-Rho and the manger symbolize the truth of Christ. The halo above the crib represents the Prince of Peace and the Glory of the Lord. Top of the window is the Star of Incarnation. The staff represents the worshiping of the Shepherds. The three crowns represent the Magi. 7-Crucifixion: The central large cross symbolizes Christ's Crucifixion. The I N R I is the sign placed by the Romans meaning Jesus Christ King of the Jews. Each side of the large cross, two small crosses representing the two thieves. 8-Resurrection: This symbolized by the tomb and staff with the banner of Victory. Within the tomb, rays of light ascending from the slab represents where Christ was laid. The helmet and sword represents the Roman soldiers night watch. 9-Pentecost: This window illustrates God the Holy Spirit "Sanctification". The dove symbolizes the descent of the Holy Spirit. The human heart is lighted by the spirits whose rays then touch and make holy the water of Baptism. 10-The Church: The ship, cross and Bible and shell represents "Go ye into all the world, teach and baptize them". The cross and orb above the cross represents the Triumph of the Gospel. 11-Penance: The keys, whip and cross symbolize our Lord's suffering. 13-Confirmation: The dove symbolizes the Holy Spirit. The shield, Chi-Rho symbolizes Christ receiving the Holy Spirit. 14-Extreme Unction: This is symbolized by the jar of oil, the olive branch, the cross etc. All these represent the liturgical act that confers the full power of priesthood. 15-Holy Orders: This window symbolized by the Chalice and Host recalling the priest's power to consecrate Bread and Wine into Christ's Body and Blood. 16-Holy Matrimony: This sacrament is symbolized by two rings and the Chi-Rho. The two rings represent those who are being bound in marriage. The flames represent God's love. The water reminds us the Christ's first miracle at Cana, changing water into wine. Mrs. Austin LaPlante gave the main sanctuary window in 1965. Donors of windows were: Mrs. Alvin Faber, Mr. & Mrs. Val Schoenhoff, Mr. & Mrs. John Holm family, Mrs. Irene Casey, Mr. & Mrs. Clarence Unterburger, Mr. & Mrs. Edmund Casey, Mr. & Mrs. Jim Elke, Mr. & Mrs. Jim Steuck family, Mr. & Mrs. Clarence Vorlicek family, Mr. & Mrs. Don Bollman family, Fred Colbergs, ­Jim Shelleys, Mr. & Mrs. Ray Strasmann, Mr. & Mrs. Art Hansen, Mr. & Mrs. Cletus Huhn, Mr. & Mrs. Ben Kelly, Mrs. Clara Casey, St. Ann's Circle. Members of St. John's parish will always be grateful to these individuals who were outstanding benefac­tors: Margaret Barret, John Barret, Edward McRaith, Daniel Doyle, Don O'Brien, Mabel Shultz. Since the Second Vatican Council, St. John's parish has been striving to comply with the directives outlined by the various decrees issued. At present, there exists in St. John's Parish Council, Liturgy Committee and Education Committee besides other auxiliary societies and committees. Through these hundred plus years many priests served the spiritual and material needs of St. John's. In the earliest days, before a resident pastor, individuals, impossible to name, supplied service for short periods. The first resident pastor was Father Cosgrove. While no attempt will be made to catalogue the contributions and accomplishments of individual pastors, all made their contributions in one way or another through their faithful and devoted service.